Every so often I watch a YouTube video of past auditions for American Idol. The video pans in on the contestants as they rally with their parents or friends, nervously anticipating what would happen after they went through “the chamber.” A little joking to ease the nerves, a lot of moving around to disguise the shakes, and a bunch of hugs go around until the door opens. A few tense moments in the chamber, and the green light flashes on. It’s show time. 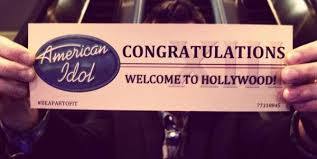 Some of the contestants hear a resounding “Yes!” after performing, and walk away with that craved Golden Ticket that says, “Congratulations, welcome to Hollywood!” Others aren’t as fortunate. Having spilled their musical guts to the judges, they exit through the chamber with three “No’s” trailing behind them. It’s a dream come true for some, and heartbreak for others reaching for stardom. Some people pursue fame, while others are content to sit behind the scenes. One thing is true of everyone, though – we all want to be accepted. We want to be loved for who we are, even if our voices crack and our pitch isn’t quite on target. Unfortunately, people’s expectations aren’t as simple as a “good job” and “we think you’re great.” Criticism shows up because we’re not good enough, breaking our morale and self confidence. We’re rejected for the next audition and suddenly our lives seem meaningless. Obviously our flaws were too big to overlook. Gratefully, American Idol, Britain’s Got Talent, and the X-Factor aren’t the only ones who have a say in our value. God has an opinion of His own . . . and it’s a little more accepting. This is good news to us acceptance-seekers! God didn’t just say that He liked us. It’s far better than that! Before the world was ever made, He had chosen, predestined, and accepted us. No one had to force Him; it was His “good pleasure” to hand us that wonderful Golden ticket of acceptance! Sure, our lives might get a little pitchy and our actions less than strong. He, however, still loves us and sends us to the next round. He may enroll us in voice lessons to fix the flaws, but He never rules out our potential and says we’re not ready for the stage. He hears our voices through the ears of the Cross, and the blood that Jesus shed in our place. No longer is our acceptance based on the sound of our voice, the charisma of our stage presence, or the uniqueness of our style. It’s based on who we are – a child adopted into God’s family. American Idol may never see our faces or hear our voices, but one thing is sure – everyone in God’s show wins.